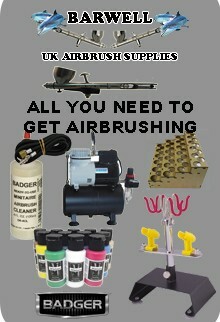 Badger Airbrush Co. offers several airbrushing tips, operating suggestions and instructions on proper set-up and air pressure ratios on the badgerairbrush.com website. 3.) After spraying design allow the colors to dry thoroughly . This will vary depending on room conditions and paint application. 4.) Heat set design by one of the following methods: - Iron using a protective cloth between design and iron for 2 minutes at 300° or hottest iron setting. Keep iron moving. - Shirt press, 15 seconds at 325°- Turn T-shirt inside out and place in clothes dryer for 30 minutes at highest heat. Note: Best if design is dried overnight. Leather - 1.) Prep leather by cleaning with acetone and a clean cloth to remove dirt, oil and waxes.